What to do before you buy. For personal and financial reasons, it's smart to check out the school district assigned to your home, as a good school district will add $15,000 to $50,000 to your home’s value. As a buyer, you need to know all the good and bad that your next home has to offer. Try and swing by the property at different times of the day to see if it gets too much or too little light, if the traffic sounds too loud during rush hour, etc. It’s exciting to check out all the bells and whistles on a new home, but don’t forget to take the time to note its storage. Check out the pantries, closets and other storage options to make sure it will work for you. A fresh coat of paint is sometimes used to cover up past issues, so take your time to examine everything and to not let that paint distract you from potential problems. I recommends to all of my buyers to have a thorough home inspection. It can be expensive, but it would be more pricey to buy the home and then find out it has foundation issues or a busted water heater. HAS THE HOME HAD ANY ISSUES WITH MOLD? IS THERE LEAD PAINT IN THE HOME? HOW IS THE HOME’S FOUNDATION? HAVE THERE BEEN ANY BUG PROBLEMS IN THE HOME? ARE THERE LOTS OF HOMES FOR SALE IN THE NEIGHBORHOOD? If so, why are people leaving? 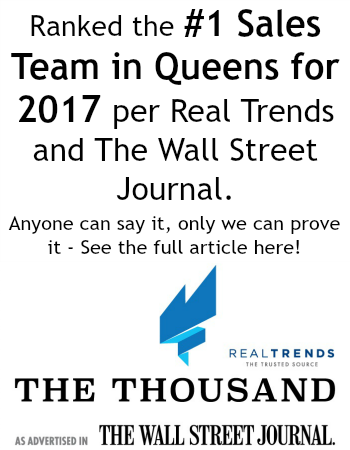 #1 SALES TEAM IN QUEENS? I enjoyed working it with Yuanzi. In a highly competitive housing market in New York, having the right broker is always key in getting a home. Without her I am sure I would not have been able to close on this house as my offer was not as strong as other buyers. However her expertise enabled the sellers to trust her which in turn enabled my offer to be accepted.